With a rich 100-year history, Da-Lite designs, manufactures and markets the most comprehensive line of projection screens in the world. Da-Lite was founded in 1909 when Adele De Berri used reflective silver paint to create new cinema projection screens, creating the legendary term “The Silver Screen.” Ever since then, Da-Lite has been committed to improving surface formulations to ensure the best surface for today and future projection technology. Designed to eliminate the extra step of finishing the screen with trim, the Advantage line of projection screens is designed with ceiling trim already in place. Once installed, the screen’s trim conceals the rough opening eliminating the need to complete additional trim work. Designed for ultra short throw projectors, the latest IDEA™ Screen features upgraded durability, surface uniformity and rigidity to ensure a superior interactive experience. The erasable surface is hotspot-free under projection, and now comes with new standard features - all IDEA Screens are magnetic and have a thin frame. It can be used with an ultra short throw projector as an interactive screen or as a whiteboard with dry-erase markers. A tray for markers makes the IDEA Screen a great upgrade to any classroom. As projection resolution advances, pixel preservation becomes much more important to preserve the clarity of your image. The chemistry behind Da-Lite HD Progressive surface is formulated to create a surface free of microscopic variances allowing the screen to essentially disappear. The result is brilliant light, vibrant color and the best surface for HD, 4K and Ultra HD projection. 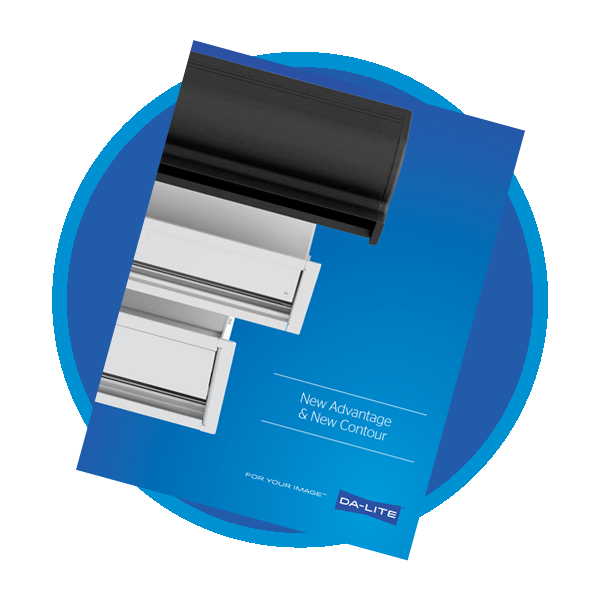 Watch a video about Da-Lite Surface Technology, or download the HD Progressive Spec Sheet. Parallax Thin features the Parallax 0.8 surface for standard throw projection. It ships already assembled with a 3/8” thin-bezeled frame. The ambient light-rejecting technology features a micro-layered optical lens system that rejects light. Each layer of Parallax plays a role in preserving the image that is reflected back to the viewer in high ambient light environments. Find out more with the Parallax Flyer. Contact your local Accu-Tech representative to learn more about Da Lite's solutions.